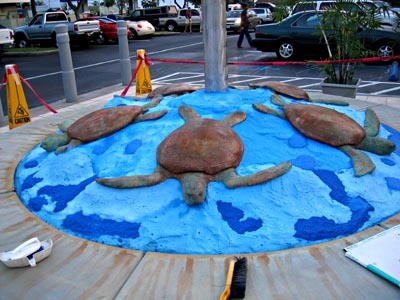 I’ve been watching this artwork coming into shape at Kona Coast Shopping Center, today I got a close look instead of just driving past and saw it was a set for five honu (turtles). The center decided to put some artwork into the center of this bench area and I was also wondering what was going on the steel pole in the center of the honu, a flagpole? A fountain? Then I noticed the artist talking to someone and cleaning up the area. 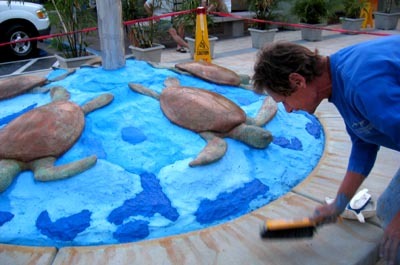 He’s Terry Taube and he’s the artist creating this scene. Made of concrete it should be sturdy enough to withstand kids who will no doubt climb onto the honu and play in that area. I asked him what was going on the high steel pole in the center and he explained the steel sculpture animals that will go up top. I won’t give it away here, if you’re curious you’ll have to ask Terry yourself when you see him working on the artwork. It should be done in a couple of months though some kind of blessing ceremony may be done in a week or so. Terry pretty easy to talk to and is enthusiastic as he explains the reason for five honu and more insight into this piece of art.